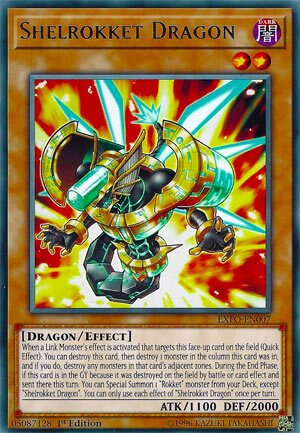 When a Link Monster’s effect is activated that targets this face-up card on the field (Quick Effect): You can destroy this card, then destroy 1 monster in the column this card was in, and if you do, destroy any monsters in that card’s adjacent zones. During the End Phase, if this card is in the GY because it was destroyed on the field by battle or card effect and sent there this turn: You can Special Summon 1 “Rokket” monster from your Deck, except “Shelrokket Dragon”. You can only use each effect of “Shelrokket Dragon” once per turn. Shelrokket Dragon is a Level 2 Dark Dragon-type monster with 1100 Atk and 2000 Def. The same two effects are once per turn. After triggered, Shelrokket destroys itself, a monster that was in the same column, and any monsters that were in neighboring columns. Upon destruction it Special Summons a different rokket from the deck. Now that that’s out of the way, Shelrokket is more nuke than pistol since it can miss. The stats are also somewhat regrettable. I think a Tuner here would have been greatly appreciated. Blowing up adjacent monsters could mean good plusses, but it could easily backfire. Situational cards can be run at 1 or 2, but don’t run 3 of Shell Head over here. Shelrokket Dragon just falls short of the mark. Happy Friday. The week ends with the final Rokket Monster until Rokket Synchron comes out, Shelrokket Dragon. Shelrokket Dragon is a Level 2 DARK Dragon with 1100 ATK and 2000 DEF, which is average Level 2 ATK but great DEF. When a Link Monster targets this card (Quick Effect), you can destroy this card then destroy a monster in the same column this card was in and if you do, destroy monsters in any adjacent columns. This can get rid of multiple of your opponent’s monster at once, only one downside, it gets rid of your monsters as well. Sure the chance to destroy three monsters your opponent controls is nice, but place this in the wrong column or your opponent makes sure you have to destroy one of your monsters to destroy theirs and you are bound to lose something. The best spot to place this might be in front of their Extra Monster Zone while you place your monsters closer to your Extra Monster Zone. Shelrokket is a decent Rokket, but be careful cause it can backfire on you. Oh yeah, the Rokket Effect is here as well. Art: 3.25/5 Yeah, not a fan of this one, it’s my least favorite art. Shelrokket (that’s Shell with one L) Dragon closes Rokket week. This Monster (which I probably should have done Tuesday but whatever and ended the week with a stronger one) is more of a defender like we opened the week with. Dark and Dragon are still in tandem here, this time being Level 2, while 1100 attack and 2000 defense are both quite solid for a Level 2. BUT, we also see an additional effect, that if you destroy that Monster, you destroy any Monsters that are in adjacent zones to that one. This has potential to + off just as yesterday, but it’s difficult and perhaps more thought out play, and you’re more likely to get more advantage off of our card from yesterday, at least in my opinion. Still a welcome effect with a nice defense (and 1100 can poke for Damage if necessary). Of course, you know too, there’s the Special Summon another, not this Rokket, from the Deck effect, and both are once per turn. I’m legally obligated to mention that as well friends. Art: 4/5 I love the red/orange we see in so many of these, but the art on the Dragon is kind of boring. I like the teal and white, but the black overall body doesn’t do much for me.